Canelo Alvarez announced his return to the ring with absolute save knockout win over James Kikrland of USA when both took the ring last night. Kirkland was reckless from the word go and he was dropped in the round when Canelo connected one after some good blows from Kirkland. In the round 3 Kirkland left himself opened to Canelo’s powerful right hand which knocked him out having been dropped again at the start of Round 3. Canelo Alvarez showed his dominance in the ring with a impressive knockout performance and now he will be eager for a match against Miguel Cotto later in the year. Apart from his great performance it was superb timing for his success after a lackluster “Fight of the century” between Mayweather-Pacquiao. This performance will go along way in establishing him the next big PPV star. As far as James Kirkland is concerned, he is a decent boxer with big heart and likes to come forward at all times but this is a level too high for him. There were geniun concerns for his health when he suffered a horrific knockout punch but overall his style of boxing is very risky as he leaves himself open to big shots. Hopefully this knockout won’t do any damage to his health. Mexican sensation Canelo Alvarez will be taking on James Kirkland of america for the catchweight fight at 154 and the fight will take place at Minute Maid Park in Houston, Texas this saturday night as a non ppv event part of HBO Championship Boxing night. 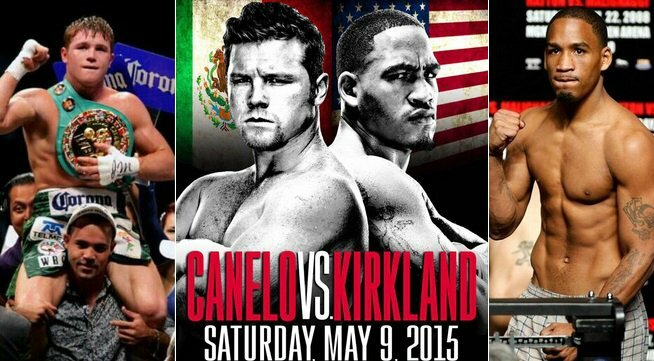 Canelo Alvarez will be making his return to the ring after almost an year out because of his injured foot, last time he fought was the PPV event against Erisandy Lara in summer of 2014. Canelo Alvarez is a former WBC and WBA super walterweight champion and since his loss against Floyd Mayweather couple of years ago Canelo Alvarez has established himself as a PPV star in United States and this fight against Kirkland was suppose to take place on 02 May but Mayweather-Pacquiao forced HBO and “Golden Boy” to push the date forward. There was another fight schedule on the undercard between Frankie Gomez vs Humberto Soto but that has been canceled after Gomez failed to weigh-in at the supposed weight and HBO released a statement today that “Gomez is not in shape and he is way overweight so to avoid any injuries to fighters the fight has been canceled”. Although there hae been a last minute change with Chinese heavyweight boxier Taishan Dong is expected to take on Joseph Diaz which will be a promising matchup between two rising stars.